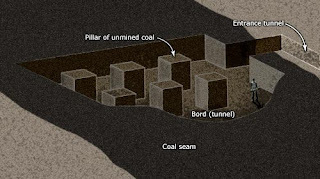 Room and pillar (variant of breast stoping), also called pillar and stall, is a mining system in which the mined material is extracted across a horizontal plane, creating horizontal arrays of rooms and pillars. The ore is extracted in two phases. 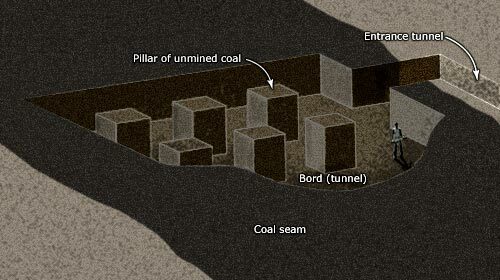 In the first, "pillars" of untouched material are left to support the roof overburden, and open areas or "rooms" are extracted underground; the pillars are then partially extracted in the same manner as in the "Board & Pillar method". The technique is usually used for relatively flat-lying deposits, such as those that follow a particular stratum. The room and pillar system is used in mining coal, iron and base metals ores, particularly when found as manto or blanket deposits, stone and aggregates, talc, soda ash and potash.